A Vegas Girl at Heart: Exciting News! I spent a couple of months working on producing a clear stamp set, and I finally have them in house and can show them to you. These are yellowing resistant photopolymer stamps, and they are made through an entirely green process (zero toxic waste). These are not the cheap clear stamps you get from the dollar bin at Michaels but a very high quality and they stamp beautifully. For my first stamp set I wanted a versatile design without a specific theme. I love the idea of stamping a solid image or an outline and stamping a word inside it, or on top of it. Some of the words fit perfectly inside the circles and squares. 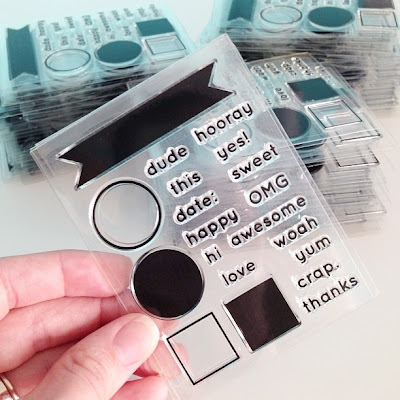 I wanted to be able to use it for Project Life, as well as for card and tag making. Next week on the blog I'll be hosting a giveaway of one of these sets, and I'll be showing you projects throughout the week using these just to give you some ideas. These will be available for sale in my shop next week as well. I'm so excited to finally show these to you! Cool! where do we get them? Cool! I love that you have "crap" on there!! I agree with Debbie.........as soon as I saw "crap" I knew I had to get these, plus all I have are dudes (except for my daughter-in-law). Hah! When I was thinking of what words I would like to stamp with, I wanted some that weren't typical. I thought OMG and crap. were perfect! Some days, you just have a bad day!